Ken Yamauchi, Architect presented an update to the school board at their recent meeting on the site improvement behind the Middle School which will create a permanent division on Fountain Avenue between Hillcrest Avenue and Sinex Avenue with cul-de-sacs and form a pedestrian walkway from the campus to the athletic field. The walkway will offer additional safety for students crossing to and from the athletic field while the cul-de-sacs will provide additional pedestrian drop-off space away from busy Forest Avenue. Removable bollards will allow emergency vehicle access across the pedestrian walkway from one side of Fountain Avenue to the other. Another portion of the project will provide a designated play area with rubber tiles for safety and maintenance alongside the track. A retaining wall will double as a “ball wall” play area outside the existing track. 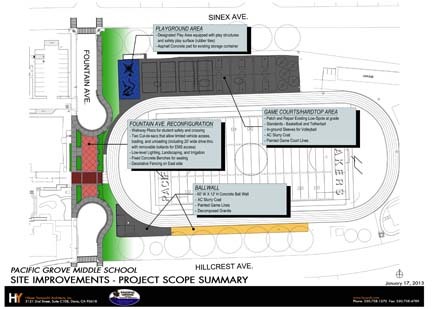 A formal lease agreement between the school district and the City of Pacific Grove, which owns the street, was reached on June 28, 2013 and the fire marshal has reviewed the project for preliminary acceptance. Construction documents are complete and were to be sent to the Division of State Architect and City of Pacific Grove Public Works Department on Jan. 25, 2013. The review period is set for Jan. 28 to March 11, 2013. The architects will back-check the plans and gain approval between March 12 and April 9, 2013 and issue notice to potential bidders on April 1, 2013. The contract should be awarded on either May 5 or May 16 by the School Board, with construction kick-off on May 22, 2013. The project should be under construction from June 3-Aug. 6, 2013. Yamauchi is with the firm of Hibser Yamauchi Architects, Inc. who were awarded the job earlier in 2012.